This restoration project is to show our appreciation through out the year on a monthly basis to our local schools. 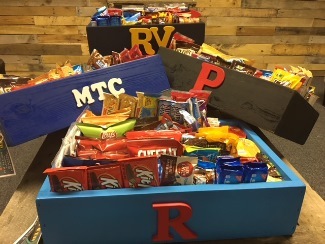 We ask that you commit to adopting a school treat box for the entire school year. You would be responsible for filling the Treat Box with packaged goodies, 1 time a month at minimum and taking it to the school and also picking it up when it is empty. This project could be completed by a family, a small group, teens or a children's group. Please contact Helen Farrington Project Lead at 419-210-0975 or Pastor Gregg at 937-657-8137 with any questions.